The newest video is for the opening of section E of the Grand Parkway and features appearances by the leaders which have brought the Grand Parkway to reality and kept Houston's freeway expansion and toll road construction program running near full-speed since the 1980s. That includes Bob Lanier, Jon Lindsay, Ed Emmett and Ned Holmes. Good stuff for a freeway historian like me, but maybe not so interesting if you have minimal interest in Houston. Currently -- and as indicated in the TxDOT video -- US 62/180 (Montana Avenue) is slated for upgrade only from Global Reach Drive east of the airport to around FM 659/Zaragoza Road. This is a very sub-urban to rural, though quickly growing, part of El Paso. 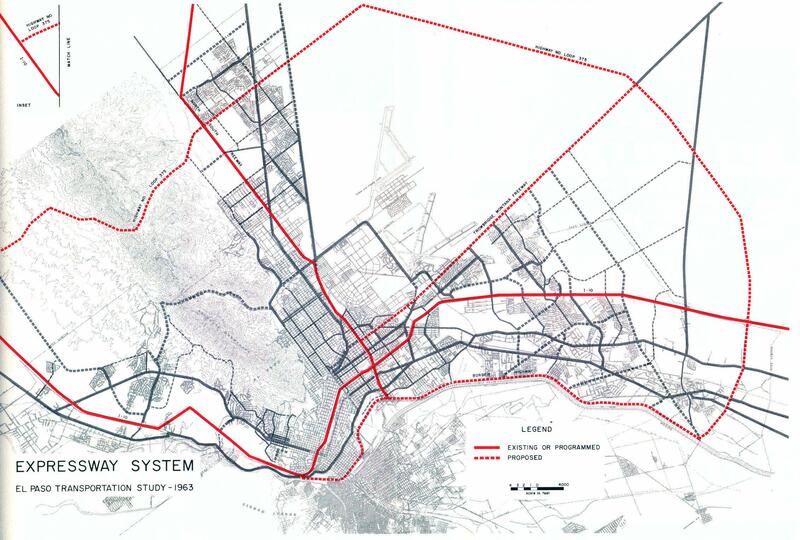 If TxDOT plans to eventually revive freeway portions east of Global Reach, it's virtually inconceivable that it would follow the 1963 alignment. US 62/180 dives south off of Montana along Paisano Drive to I-10 several blocks west of US 54. To follow the '63 alignment would not only require acquisition of ROW, but acquisition of ROW through the Austin Terrace Historic District.